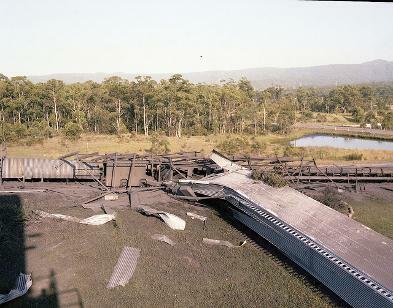 Mine explosion fire West Wallsend Number 2 Colliery, 9 January 1979. Courtesy of Brian R Andrews. Damage from explosion West Wallsend Number 2 Colliery, 8 January 1979. Courtesy of Brian R Andrews. The West Wallsend No. 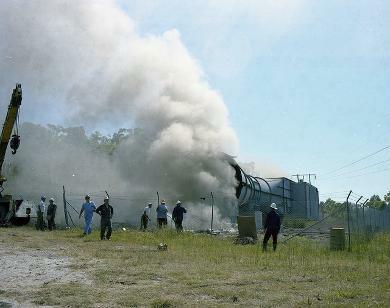 2 Colliery explosion, although it made the local papers, not much was written about it and was kept hush hush at the time. It happened on 8 January 1979 at approximately 5 am in the morning when the power was switched on underground after being off from Saturday afternoon unbeknownst to the colliery. On the last working day of 1978, a truck going through Edgeworth ran into the substation at that location. In the afternoon of 6 January 1979, the power to the area was cut off in order to carry out major repairs at the substation. When the power was cut off, the fan stopped. Fans had to be manually started and did not automatically start when the power was switched on. Since the colliery did not know the power was to be cut off, the fan stopped and the underground workings were filled with an explosive mixture of methane. When the power was switched on, a spark ignited the methane and the result was an explosion.